This run was a pretty big deal for me. I hate running. I hate it. I hate it, hate it, hate it. I have never enjoyed it. EVER! I was athletic in high school I guess. I played soccer all 4 years and did track and field for 2. But the emphasis was always on the "and field" part. I would do triple jump, long jump, discus and shot put. Anything but actually run. Same with soccer. I played goalie, why, because the farthest I'd have to run at any given point was 18 yards and back to my goal line. Hello. I hate running. Then back in September 2010, 9 months after having Sarah, my friend Bekah was touting the benefits of Couch to 5k. I've never run 3 miles in my life so it was a huge challenge but I started and worked my way through the program. My husband I signed up for our first 5K ever, the Grizzle House 5K that is apart of the St. Jude Memphis Marathon. I excitedly went down to the expo to pick up our bibs and was swept up in the excitement. I loved walking around the expo. While I was there Run Disney had a booth set up. The were passing out crowns and pixie dust and promoting their various races. In particular they were promoting their Princess Half Marathon that is in February. It wasn't sold out yet and they were offering discounts, I think, if you signed up right there. I was really tempted. I even tried to talk Bekah into it. But it was too much money, not enough time to train, and just a crazy idea. So it wasn't in the cards for me in 2011. It was also a no go in 2012 because I had Cody and he was only 5 months old when the race came. No time to train for that one either. But as I read all the race recaps and saw all the hubub on my FB news feed (I "like" Disney World and Run Disney) I longed to do this race. 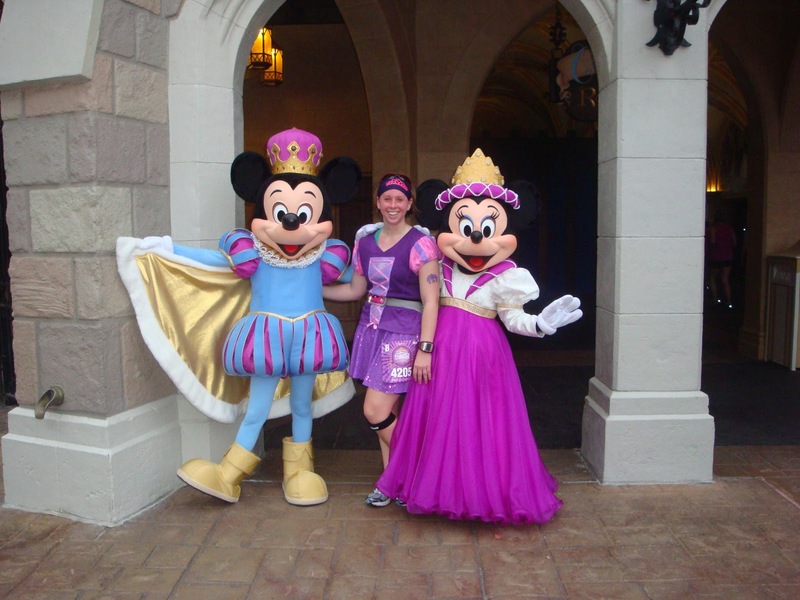 If you are going to run 13.1 miles on purpose it has to be in the happiest place on Earth. 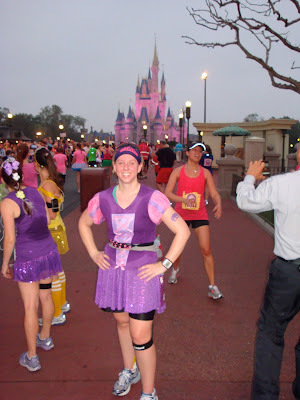 So I set a goal right then and there knowing that I was still many months away from being able to run, that I was doing the Princess Half in 2013. Period. I thought it would be my one and only half marathon ever and it would be great. But as I did research I realized in order to really enjoy it I needed a leg up. I needed to submit a time and hope for a better corral placement. So I signed up and did the St. Jude Half Marathon. It was absolutely the right idea! I was hoping to make it into the 3rd or 4th corral (out of 8). I was thrilled silly when I got my bib and realized I had made it into the 2nd corral! I begged a friend to make me a costume. She did an amazing job! It was perfect. My wonderful amazing mom came to stay with Cody while we went to Disney. My fabulous in laws drove Sarah down in their car since they were going to FL that same weekend for a wedding. And Chris and I flew down as soon as he got out of class Friday morning. 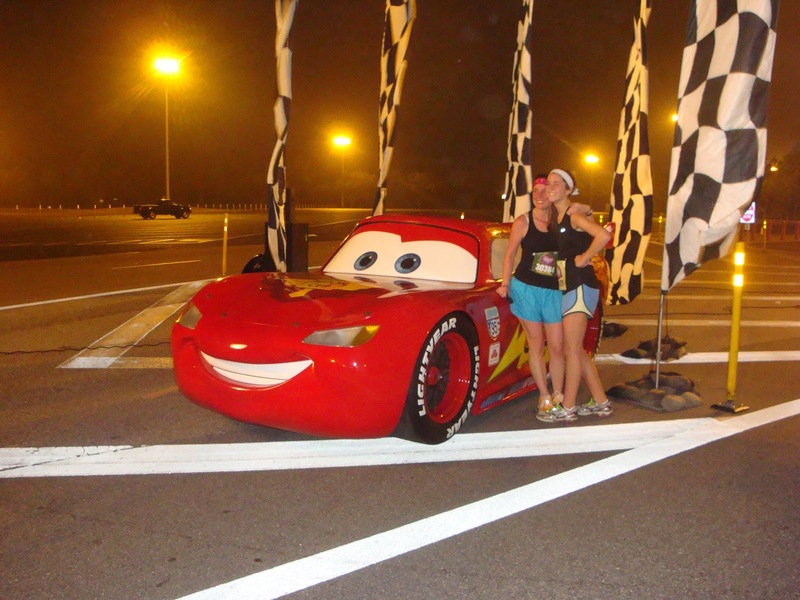 Now, we usually stay with my Aunt when we got to Disney but for the night before the race we sprang for a Disney hotel room which was a really good idea. I HIGHLY recommend that. Because you have to be in your corral at 5 am! That means you got to get up and get moving. I'm not sure I actually slept at all the night before the race. Finally at 2:50 am I got up and started getting dressed and was down to the bus line at about 3:25. On the way to the bag check they had some cute "stained glass" windows to take your picture in front of. 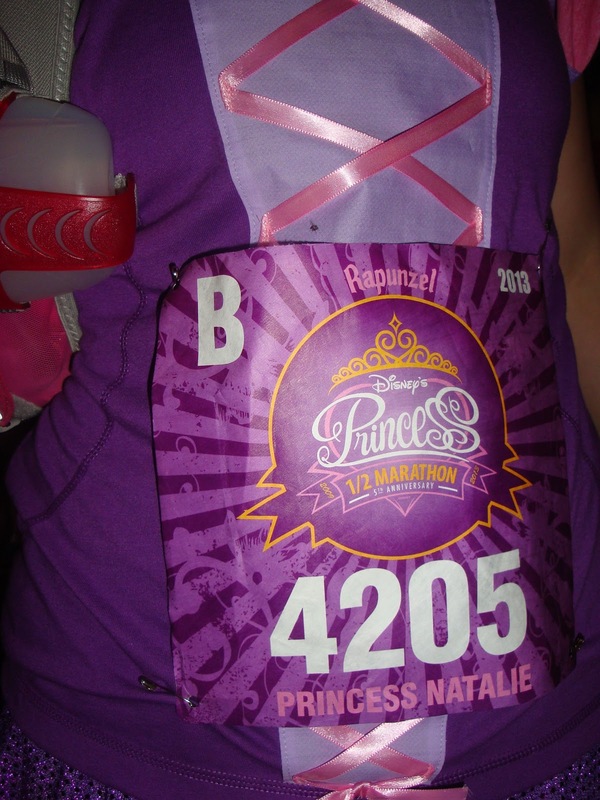 When you register you tell them who your favorite princess is and your bib will be that color. I really like Mulan but that wasn't an option so I picked Rapunzel for Sarah. Alright, then it was a long walk down to the corrals, they warn you it'll take 20 minutes, and I nervously found my way into Corral B (after first accidently going into corral C). There I chatted with a nice lady from California. She had done the Tinkerbell in January and was there to earn her Coast to Coast. I thought that was pretty cool. 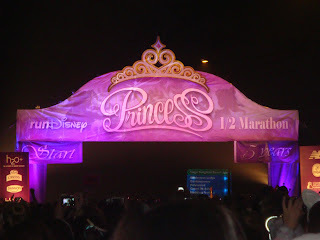 Then the Fairy Godmother appeared on the Jumbotron and started the race with the elites and all the gazzels in Corral A. What I love is that the Fairy Godmother wishes each corral a good race and sends us off with fireworks. Not just the first group. So at 5:35 on the dot she said bippty boppty boo and we were off! I knew I wanted to have a good time and take lots of pictures but I also didn't want to be running all day. So I only stopped for the long line of pictures if I REALLY wanted that shot. Otherwise I only stopped if the line was short. I knew I wanted a picture with Captain Jack so I put in the time in line there. 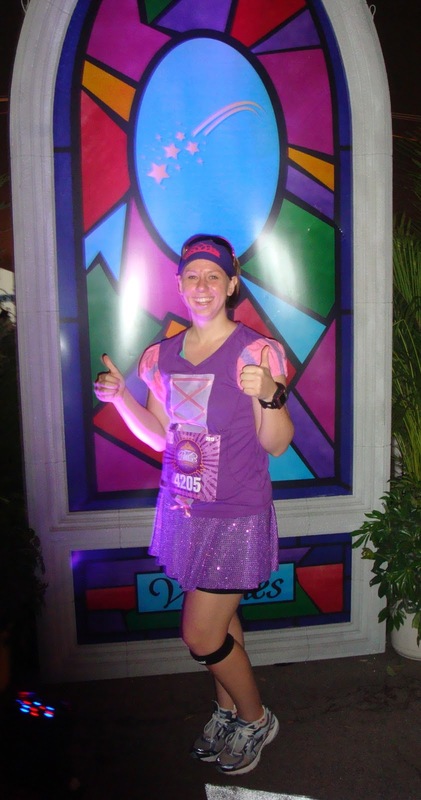 But waiting there so early in the race made me nervous so I didn't stop for anymore pictures after that until I finally made it to the Magic Kingdom (mile 5 or 6). Captain Jack was pretty funny. 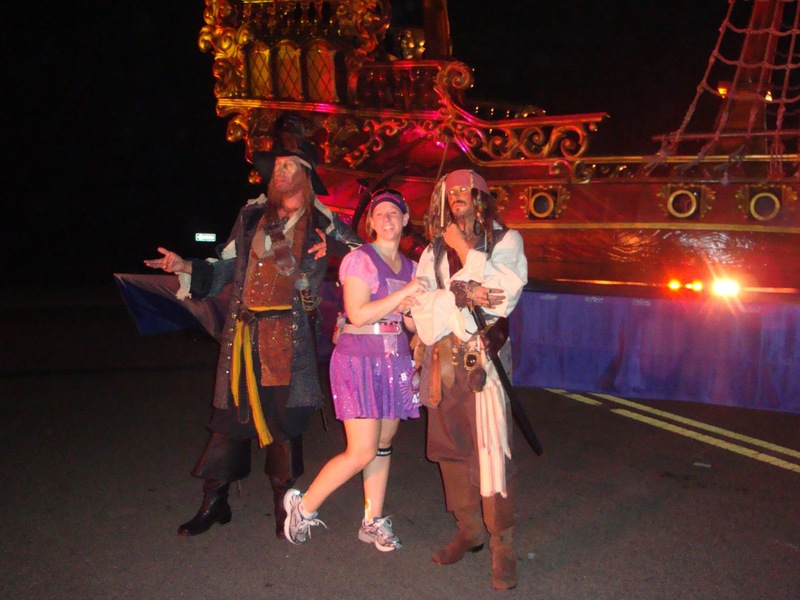 Some girls ran by and yelled, "I love you Captain Jack" and he'd yell back, "And I you!" So since I was nervous about stopping for pictures I didn't wait in line but I snapped one of Lightening McQueen. They had Life is a Highway playing there. And I leaned over some girls and snapped a picture of the villians. They were playing Cruella deVills song when I passed. Then I ran through this glorious sight. But don't let it fool you. 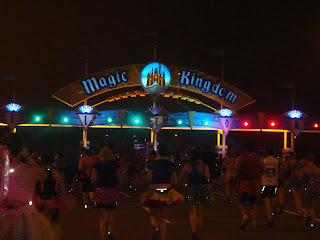 We were still about 2 miles from actually entering Magic Kingdom. Still it was nice to feel like we were getting there! Yeah, it was really hot. I sparkle a lot when it's hot. Then we rounded the corner and headed over the bridge into Tomorrowland. I saw Buzz out there taking pictures but I didn't stop. After that you run past the teacups ride where Alice and the Mad Hatter were. I would have stopped but we had just had breakfast with them the morning before so I didn't want to waste precious picture time. As we passed through fantasy land they had a 2 part line for Gaston and Belle. So I stopped to take a picture with him and then didn't join the next line for Belle. 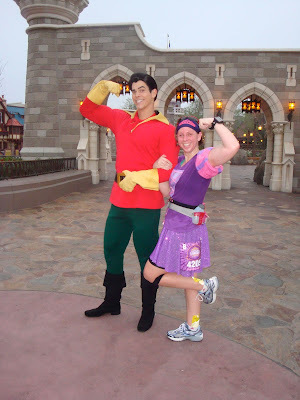 Gaston was a hoot! He was flirting with all the girls and one lady in front of me was dressed like Belle so he said something to the extent of being glad she had finally come to her senses and agreed to marry him. Then you run up the backside of the castle and they have troubadours playing over the balcony. I took a picture. It was blurry. I have no excuse for that. Sorry. And there before you went through the castle were Mickey and Minnie and I HAD to have that picture so I waited in the really long line for it. But I used that time to fuel up. It was really hot so I popped some of my gummies in and tried to replenish and rehydrate. 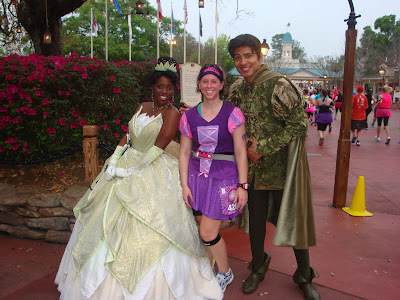 Then it was through Liberty Square (I think) where I paused briefly to take a picture with Princess Tiana and Naveen. And then you exited out of the Magic Kingdom through a side gate by Splash Mountain. 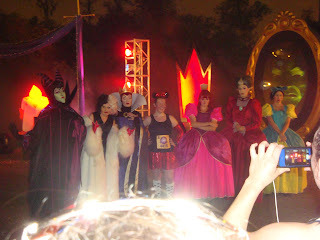 I'm sure I didn't see all the characters in the kingdom but I saw plenty I thought. 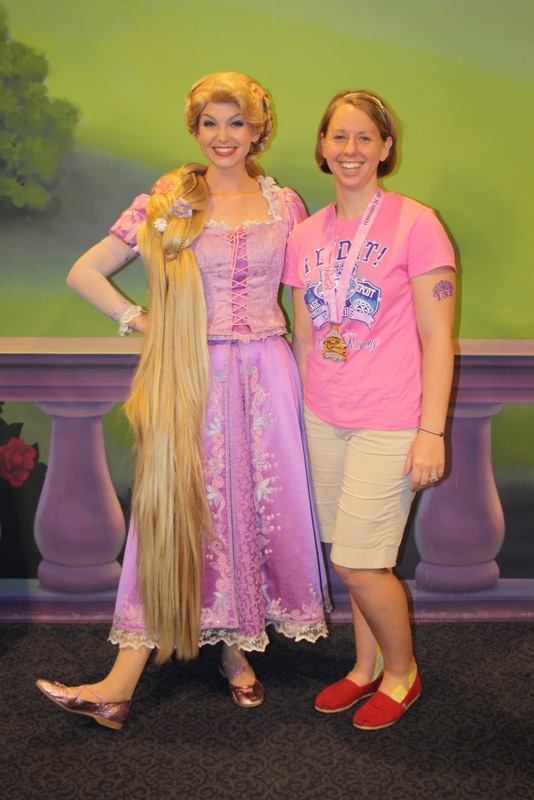 However, I was actively looking for Rapunzel but didn't see her. If she was out there, I missed it. After that we ran past the Grand Floridian where Mary Poppins and some of the chimney sweeps were. Again, I would have stopped but we had breakfast with Mary Poppins the day before so I kept on going. Then as we passed the Polynesian Resort Lilo and Sitch were out. So I stopped for them. Unfortunately Stich was just leaving for a break when it was my turn. =( Oh well. By this point it was mile 8 or 9 and I was ready to be done so I tired to wrap up my photo stops. Plus there weren't that many characters out anymore. I did stop for Princess Anna from A Bug's Life. She didn't have a line. And I should have stopped for the Green Army man around mile 9 or 10 who was shouting out orders. He was pretty funny. But again, you reach a point when you just want to be finished so you push through and hoof it to the end. My wonderful husband, beautiful daughter, Aunt Sarah, a few friends who were waiting on their family were waiting for me at bag check. Chris felt bad he wasn't at the finish line but I told him not to worry about it. It would have been impossible to find him in that crowd. He did however see me finish because I made sure to run in front of the camera for him and he did happen to look at the jumbotron at the right time so he saw me give Minnie Mouse a big hug. Remember that shirt was a lighter purple...yeah, it was pretty hot. I dreamed about this race for 2 years and trained for it for probably 9 months since I had to start back over at C25K for it. But it was worth it. 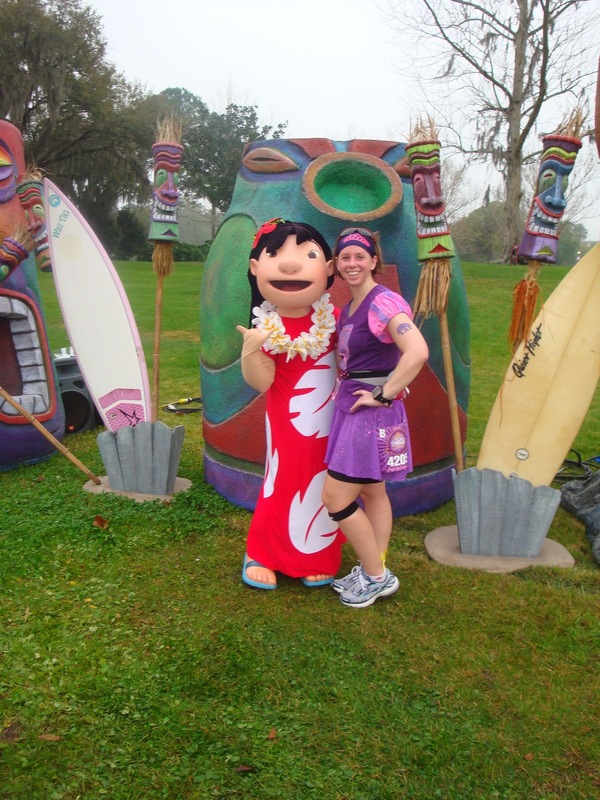 There were plenty of times during the run I was miserable. I hate running after all. There's a lot of things I would do differently. I would really have had more fun if I had had someone beside me the whole time. But I am definitely glad I was able to do it this year since it was the 5th anniversary the medal was revamped and AMAZING! I mean, it's all about the bling people. At some points in the race I was glad I would never do it again, but now that I'm a few days away from it. 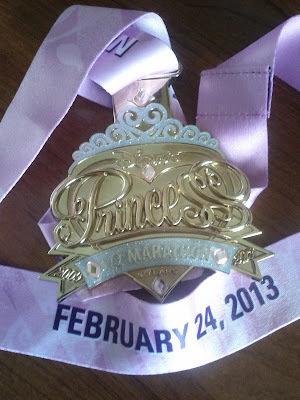 I think it might be fun to revisit this race every 5 years, you know, as long as the medal is cool. Afterwards we headed back to the hotel room so I could shower real quick and put on my souvenir "I did it shirt!" 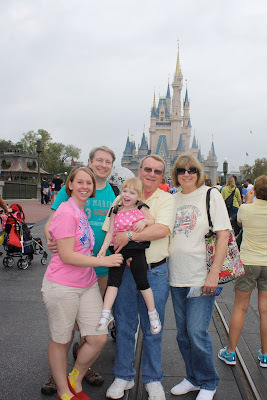 and pick up Grandma and Grandpa Schwartz so I could walk around the Magic Kingdom like a rock star. I highly recommend doing that if you ever run this race. First off it hurts, but walking and moving was the best thing I could do. Aside from some sore quads the next day when I walked up and down stairs I was feeling pretty good. AND when you walk around with your medal on practically every cast member tells you congratulations and how awesome you are. 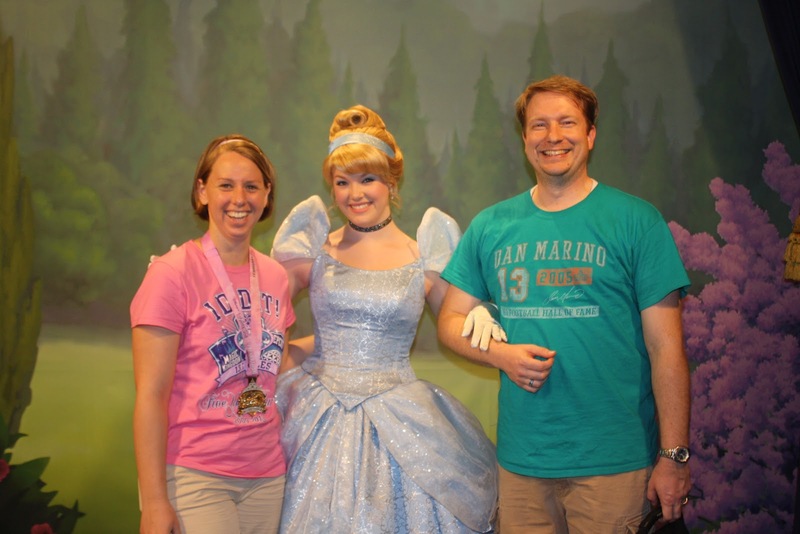 Even Belle during the Enchanted Tales show told me congratulations. Plus it impresses the princesses. So here's the point in the race recap where I would normally tell you my time and place but I honestly wasn't paying attention. I tried to stop my Garmin for photo stops but I wasn't always on top of that and I didn't stop my watch until after I came out of the food area and realized it was still running. So my Garmin said it was 13.28 miles (see forgot to stop it until after the food area) in 2:40 something. I can't remember and I'm not getting up to go turn it on and look. 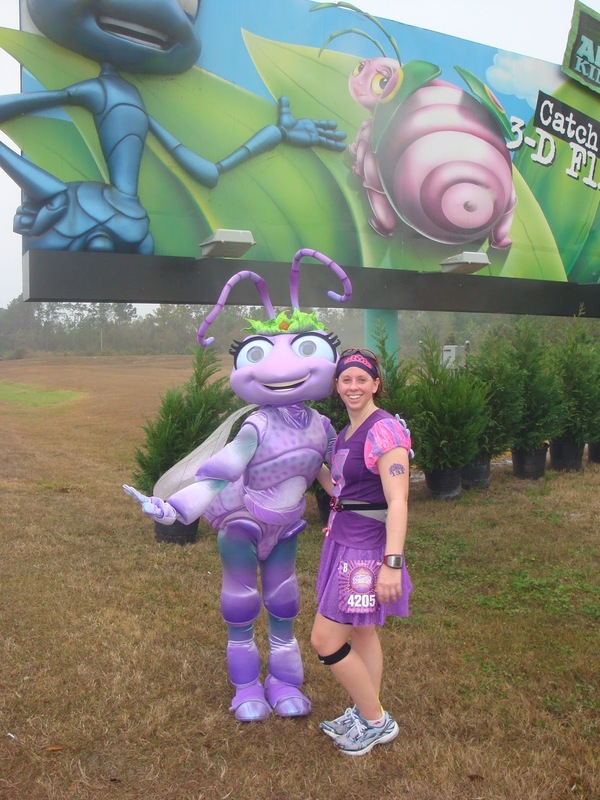 Chris got text alerts along my course and I think he said Disney told him my official time was 3:01. Like I said, not my fastest race. But definitely my most fun. I did meet up with Rapunzel and tell her all about my costume I made too look like her in the race. She was impressed, and I was impressed that she said "we blondes have to stick together" I figured my hair was too dark now to be considered blonde especially since Sarah keeps saying, "Mommy has brown hair, not blonde hair like me and daddy." So fun! What a great trip for you and Chris. Y'all deserved it. And, how cool that Sarah and your in-laws were there, too! Seriously, I think you have the most supportive family EVER. It makes me crazy jealous. Anywho.. I love your costume and your medal, HELLO! Impressive. I can't believe you've run 2 halves! No matter what you say, you ARE a real runner. Try it.. 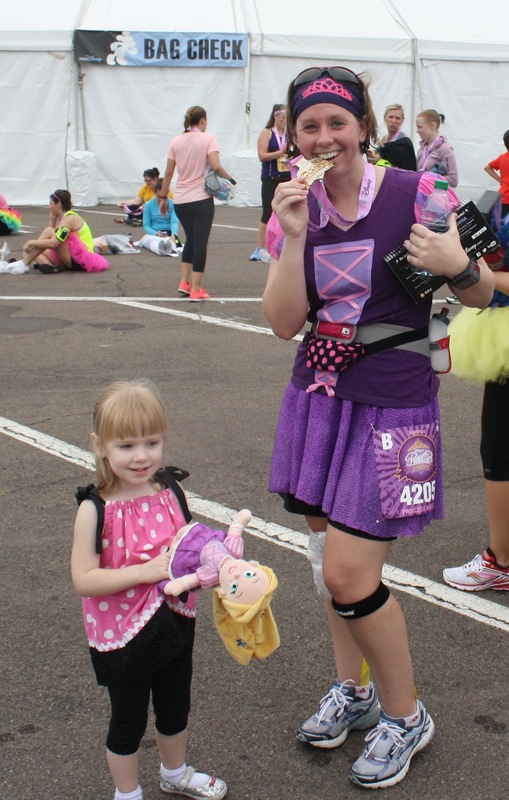 I'm Natalie and I'm a real ruuner, a REAL FREAKIN' RUNNER! Congrats , for sure. You inspire me. I hope it'll be me running beside you for the next one in 5 years! I've been waiting for an update! Congratulations on such an accomplishment and for the great blog post. You are definitely a "real runner" if you get up for a race at 3am!